My works and all are around creativity, expressions and accessibility. I envision a community that is creative and healthy – both physically and emotionally. I would like to make the society a better and happier place through music and art. I would like to make music and art accessible. 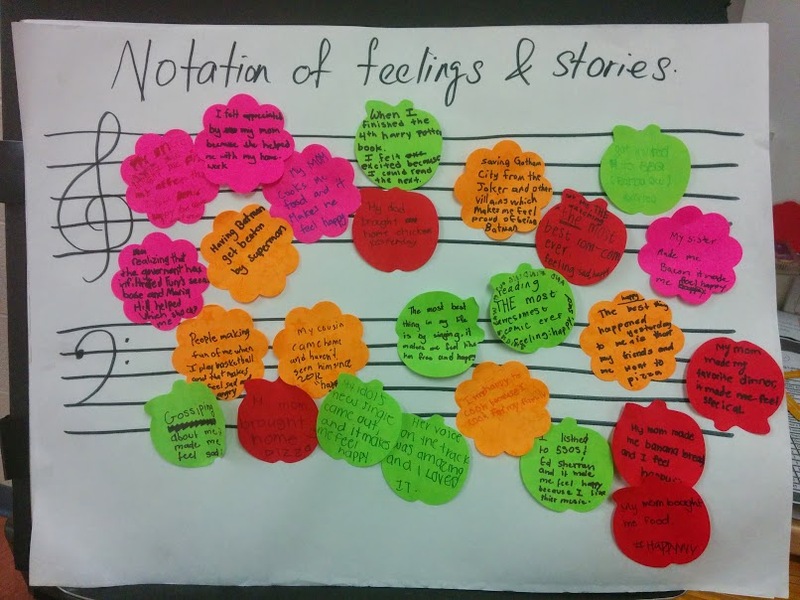 Notation of Feelings and Stories. One of my regular activities for youth/children workshops. This specific one done at Our Lady of Lourdes Catholic School, a part of creative music program with Arts for Children and Youth. Works are self expression, don’t stop creating. The quote was inspired by abstract-expressionist-artist Agnes Martin. Creative expressions push us forward, make life more interesting and lead a healthily balanced life. I value improvisation a lot in music and art making. Improvisation is about the moment that is shared by everyone in the same room. I believe art is in all of us. We were born artistic in our own ways. I believe art can make a change. I believe each of us can make a difference. Last but not least, have FUN and don’t stop creating!